We now know the NGP's true name. Sadly, this does not allow us to bind it to our will. As part of its E3 press conference, Sony has dropped a veritable ton of details about its successor to the PSP, including answers to the all-important questions of how much it's going to cost, and what the device is actually called. Sony has dropped the "Next Generation Portable" codename, and confirmed the rumors that the official name for the device is the PS Vita. The Vita will cost $250 for the Wi-Fi only version, and $300 for the 3G enabled version, and according to Sony, the price in Europe will be the same amount in Euros. The UK price is yet to be revealed, but around the Â£230 mark for the Wi-Fi only - the same SRP as the Nintendo 3DS - seems likely. Sony also announced that it has partnered with AT&T to provide 3G coverage in the US, and will undoubtedly announce similar deals in other territories soon. Considering the amount of technology in the Vita, which includes front and back touch screens, motion controls and dual analogue sticks, the price is surprisingly low. This could mean that Sony is making a loss on each unit sold - although SCE Europe boss Andrew House indicated back in January that Sony wanted to make a profit on the device - or it could mean that the rumors that Sony had cut down the Vita's capabilities to make it more affordable are true. 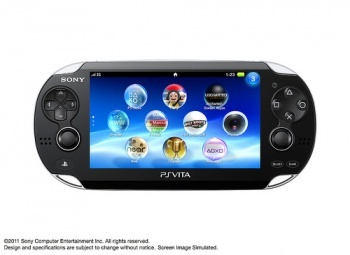 The PS Vita is scheduled for release at the end of the year.